To create an empty Shape file, simply send to the writer a feature whose geometry does not match that of the destination feature type. 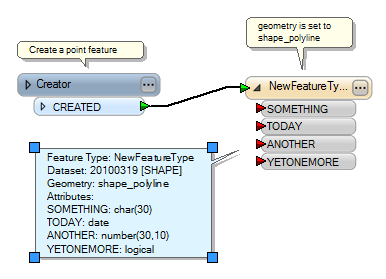 There will be a warning in the log file, but the empty or schema-only Shape file will still be created. Note: The method can be used with any format that supports single geometries only. This can also be accomplished by using formats that support template files, such as Geodatabase or AutoCAD. For information regarding a Geodatabase template file, please see Esri Geodatabase Writer Parameters and Converting to Geodatabase Format. For AutoCAD template files, information can be found in Autodesk Writer Parameters.